With a plethora of tourist attractions and historic places to visit, you’ll never be short of things to see and do when you go to Thailand for your next holiday, but if you’re looking for that truly unique Thai experience, nothing beats heading down to the floating markets. It is in these places where you’ll see the real market culture of Thailand, from the vendors to their produce and the Thais trying to haggle or ask for a bargain. So when you do get to Thailand for a vacation, try to step away from the high rise towers and industrialized and commercialized tourist attractions. 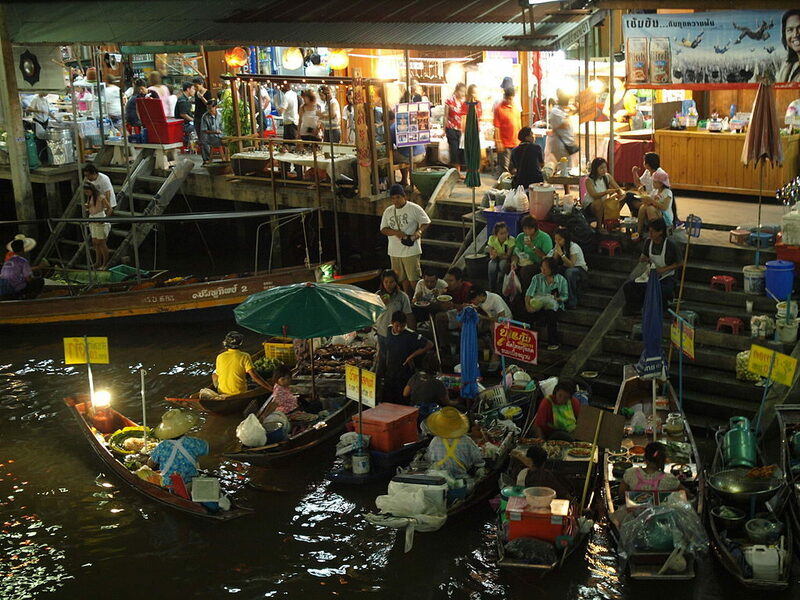 Instead, go to one of the floating markets mentioned below and immerse yourself in the people and culture therein. This floating market is located in the Samut Songkram Province, about half an hour away from Bangkok. This is said to be the largest floating market in Thailand and because of its size, you can expect a lot of vendors and buyers here. The market starts to open at one in the afternoon, although the majority of shops and stalls open at around four in the afternoon. Thus, it is recommended that you go there in the early afternoon, in order to avoid jostling your way around the streets. 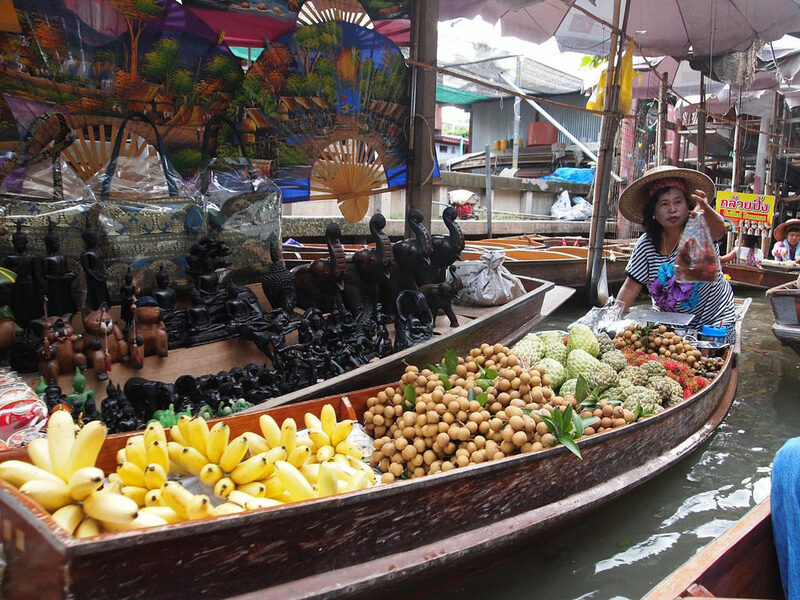 Here at Amphawa Floating Market you can find various items for sale, from fruits and vegetables to souvenir items. However, the more popular goods are the food. You can buy Pad Thai, Curry, and others from the long boats or open air restaurants. Unlike Amphawa Floating Market, Damnoen Saduak is very touristy as it is one of the most favoured stops for many organized group tours. This is especially true during the weekends. As such, expect to see a lot of souvenir shops here. Damnoen Daduak Floating Market is located in the Rajburi Province, farther away, at about one and a half hour from Bangkok. 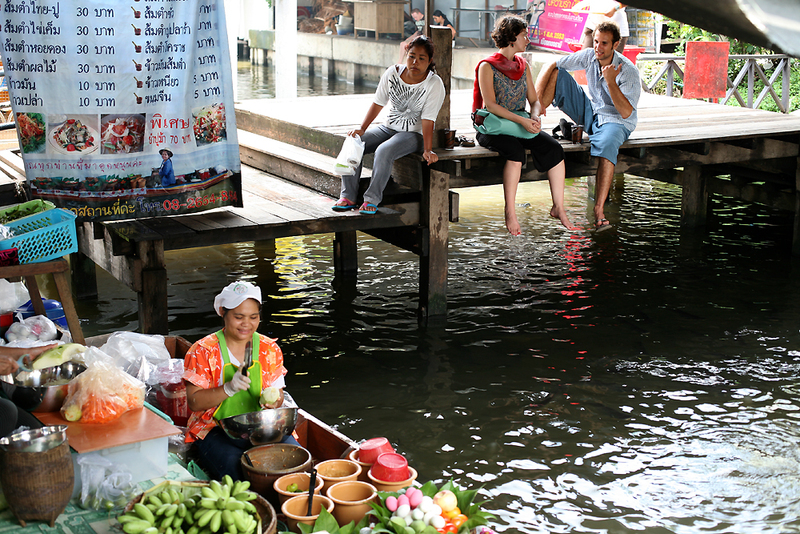 This provincial place populated mainly by farmers and agriculturists, so you will mostly see fresh produce being sold in this floating market. The best times to be there is in the morning, so you can avoid the sweltering heat of the sun and when vendors and their boats carry fresh produce like oranges, papayas and tons of fresh vegetables from the nearby orchards. This floating market is smaller than the other two above, and thus has lesser crowds. There aren’t a lot of boats and vendors here – just enough for it to be considered a floating market. This is a personal favourite as you don’t have to jostle your way around like in Amphawa, and there aren’t a lot of foreigners shooting photos every now and then like in Damnoen Saduak. No, Taling Chan is a simple and charming market that caters to those who want an alternative to touristy and crowded floating markets. Despite being small, there are many things sold in Taling Chan Floating market, but the most famous would have to be their freshly roasted seafood. You can grab yourself roasted squids, crab legs, prawns and so much more, which you can enjoy while you get a foot massage under the shade of trees.